Contact | Department of Computer and Information Sciences, Tokyo University of Agriculture and Technology. Please see the following page for inquiries regarding General Undergraduate entrance examinations, Transfer Student Admissions, and Graduate School Admission Examinations. * Contacts for teaching staff can be found by clicking faculty names on the introductory pages for each laboratory. For other questions or inquiries regarding the Department of Computer and Information Sciences, please contact the Computer and Information Sciences Office. For inquiries including research collaboration and technical consultation, please contact the relevant faculty directly. Contact details can be found by clicking faculty names on introductory pages for each laboratory. For inquiries regarding divisions and others, please contact the Computer and Information Sciences Office. Take the JR Chuo Line from Tokyo Station (Rapid-service Train) to Higashi-Koganei Station: 37 minutes. Walk about 6 minutes to campus from nonowa Exit of Higashi-Koganei station. The Department Office is a first floor in building 7, Koganei-campus. 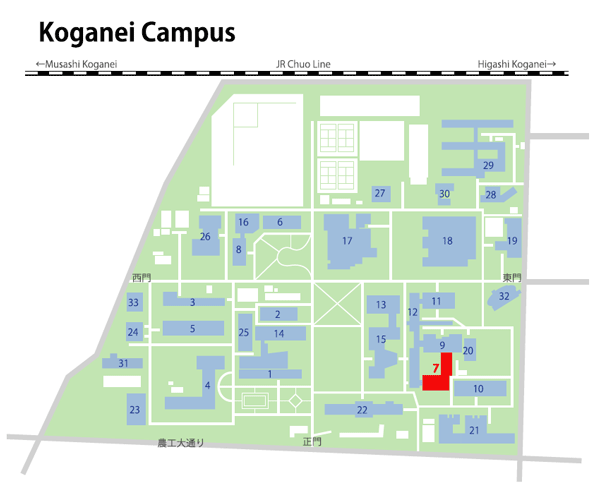 Please see the following page for the access information to Koganei Campus.